I wrote and published 2 books and a new deck of cards (coming soon). I started a new brand and website, A Moment for Me, and got the books on Amazon too. My 9 month intensive training program, Lightworkers Intensive, sold out and began its new year. All of the above got started in addition to the usual business of running my school, growing my practice, volunteering for Hospice, and taking care of my kids. So, how did I do that? Sometimes I wonder. What did I learn so far? A lot! The biggest lesson is that even the busiest person can find 30 seconds to do something that changes their day, their relationship, outlook, physical health, presence, and grow as a person. Really, 30 seconds. We, as a society, are busy. I mean REALLY FREAKING BUSY. I know I'm not the exception, but lots of people are as busy as I am trying to keep it all together. So, I started by brainstorming 30 second ways to pay attention to mind, body, spirit, and emotion with mini-tasks. I made 36 cards, and then challenged myself to make 365 more for a daily calendar. (And I made a free app! Want it? Click here.) And a free daily email. Dang, that's a lot. Then, I moved on to motherhood. Moms are such carriers of responsibility! They're busy. Real busy. What am I talking about by saying "they"?? We're busy. Anyway, yeah. Coming up with 101 Moments for Mom was a good lesson for myself too. Then, I moved on to relationships. There really are 30 second ways to make a relationship closer, more loving, and more fulfilling. I came up with 101 ways and made them into a book. Two students asked me to make the book into a deck of cards, which, of course I did, it is currently in the graphic design process, and will be available in a few more days. I'm going to actually try all of the ideas with my husband. (I'm sure I'll need to remind him and maybe nag a little at first, but I think it will become a good habit for us.) I could feel the potential lasting power in each task as I wrote them. With Valentine's Day around the corner, and this 30 second idea on my mind, I decided to really try to explain how this concept could work. To reach the most people in an hour, I'm hosting a free class called 30 Second Self-Care. It's online this Thursday night, and everyone who attends will be given a 50% off discount code for a signed copy of my new book, A Moment for Us: Care for Busy Couples - 101 free ways couples can enjoy more love, caring and togetherness in 30 seconds. In the class, I'm going to talk about what stops people from taking care of themselves. There are so many things that get in the way, from feeling like there's no time, to denying that we need it, to trying to feel empowered by pretending we have it all together. I know, because I do every one. I'm trying to change this by putting it out there, and then talking about why and how to change it - in only 30 seconds a day. Come take it. The class is only an hour. And it's free. The busiest person can find 30 seconds. The benefit of these tasks last so far beyond 30 seconds, that it can change your entire self-worth, presence, health, abundance, and relationships. Want to see how it's going for two people who are committed to trying this daily? I hired two busy people to try out the calendar, and publicly blog about it every single day of 2015. You can see Doug and Michelle's journey with 30 seconds a day by reading the comments at the end of each blog post here. I'm captivated by the idea of 30 seconds, and think I'm onto something. You can expect more in the A Moment for Me series this year - my goal is to write at least 6 books in 2015. I'm also planning to give a Ted Talk on it. It's gonna happen, my friends, and you read it here first. The details will fall into place, just you wait. Now you and the Universe know. So everything else is already in motion to make it so. Got 30 seconds? Sure ya do. Your comments are so welcome, always. Great ideas here! I'll have to try that app - even just dedicating 30 seconds a day to something seems like a great small step to improving things in my life. Please let me know how you like the app. 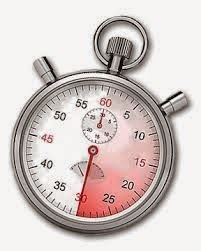 I really agree that 30 seconds, when used the right way, can be really effective at making big changes.